Black SenseMark on Liner. Topcoated Direct Thermal is a topcoated medium sensitivity product with an all temp acrylic permanent adhesive. This material has excellent image quality and it provides excellent results in most environmental conditions. 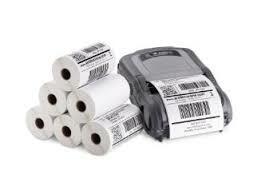 We recommend that any product be tested in an end-user application before ordering large quantities. 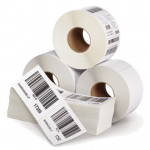 Be the first to review “4″ x 2″ Direct Thermal Paper Labels for Zebra P4T,QL, QL PLUS SERIES, Perforated, 0.75″ Core, 2.5″ Outside Diameter, 300 Labels/Roll, 33 Rolls/Box, $21.88/M (17.94/M sale price)” Click here to cancel reply.